From 1530 until Napoleon’s arrival in 1798, Malta was under the control of the Order of St. John, or the Military Knights Hospitaller, an order founded to care for religious pilgrims and the infirm. In time, however, they joined their Crusader brethren in fighting, and the island remained a Crusader state long after other military orders lost their strongholds. January 2015, panorama from 4 horizontal images, additional exposures for highlights, focal length 16mm, aperture f/8, shutter speed 10 seconds, ISO 100, tripod. I think of this as I take in an evening view from the top of the Hotel Juliani. There’s so much history in such a small part of the world. 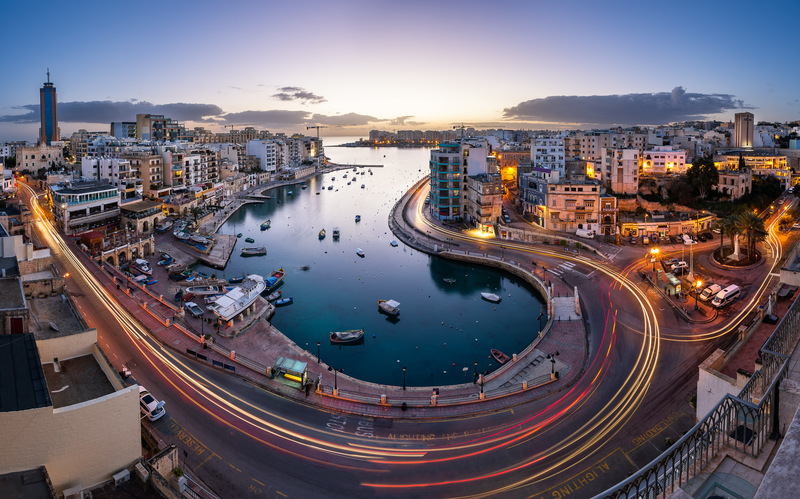 Its location in the Mediterranean has made Malta a crossroads of sorts between European, Middle Eastern, and North African cultures, and like many of the world’s crossroads, its history has often been one of invasion and conquest. Invaded by Arabs and Normans and bombed by Axis forces during World War II, the island now faces a different kind of invasion — tourists. From my vantage point on top of the hotel, my head swims a bit at the thought of such a long and storied history. Looking out over the curiously-shaped Spinola Bay, I was struck by the juxtaposition of Malta’s long history with its modern incarnation. It was dawn, St. Julian’s was beginning to come to life, and the city’s skyline was streaked with the headlights of passing cars. I found a spot that allowed me to capture the unusual curve of the bay, and framed the shot to catch as much of Malta’s past and present as one photograph would allow.